This week has been a long one, mostly waiting for my Stampin' Up! goodies. They finally arrived and I have spent lots of time in my craft room trying out all my lovely new products. One of my favourite stamp sets is Garden in Bloom. So I decided this was what i would use for my blog project today. 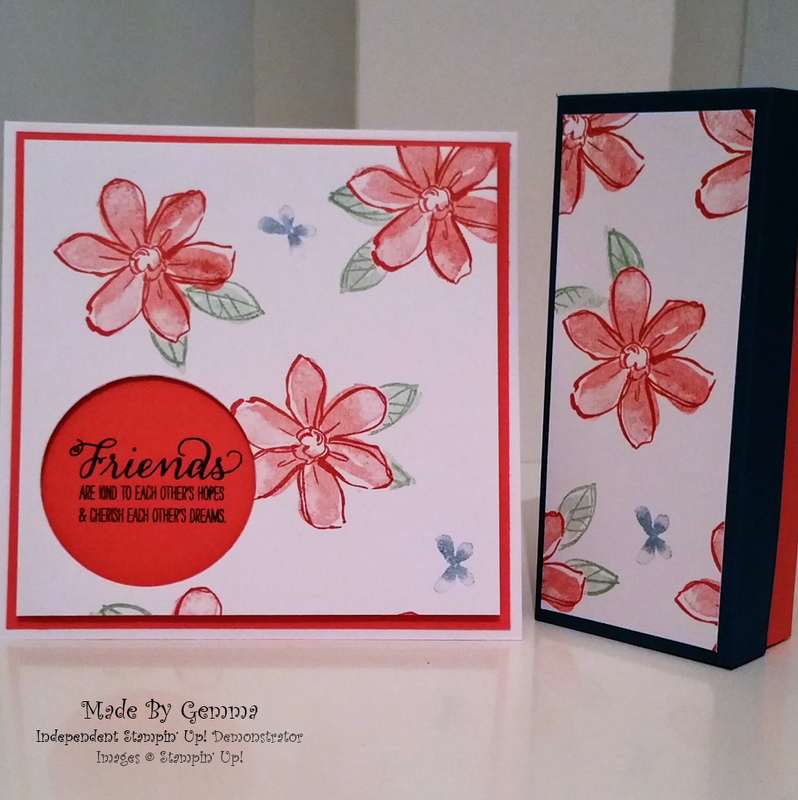 I have made a very simple gift box and a card but i used the stamps to make the background patterned paper to decorate the box and card. I used Watermelon Wonder and one of the new 'In Colours' Dapper Denim. The stamps are a Photopolymer set so are great for two step stamping. 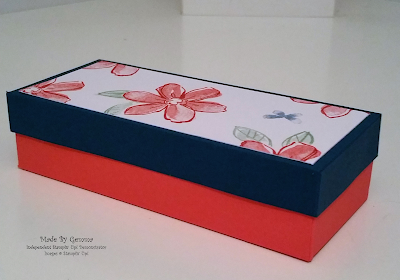 To make the box I used a piece of watermelon wonder for the base and dapper denim for the lid. It is a simple box but i think it looks quite striking in the contrasting colours. When i made the card i used a 6" x 6" white card blank and cut a piece of watermelon wonder to 5 3/4" by 5 3/4" square. To make the background for the card and box lid I randomly stamped flowers, leaves and the butterfly shape on white cardstock. 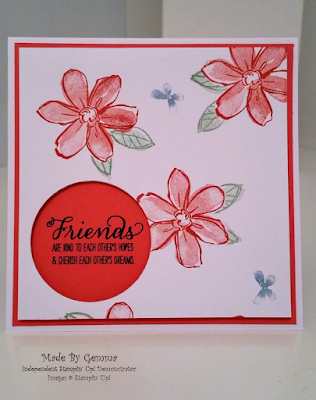 For the lighter coloured flower I inked my stamp up, stamped it on scrap paper then onto my cardstock. I also used some Mint Macaron for the leaves. The main colour is Watermelon Wonder. 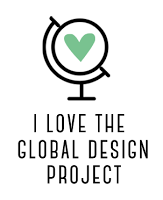 I die cut a circle in the bottom left corner and stamped the sentiment in Dapper Denim to show through the circle. To mount it to the front of the card i used the new Foam Adhesive Strips, Which are in the new Annual Catalogue that will be available from the 1st June 2016.